This tour has been a very long time in coming (we've been planning it for over 2 years), but now our departure has finally arrived we're very excited about it - our rough plan is to travel up to the top of Norway - Nordkapp - and then meander home via the coastal route, taking about 4 and a half months to complete our journey! We've already done quite a bit of planning concerning what we want to see and where we want to go but we're very aware that hundreds of travellers have gone before us so if anyone reading this has any hot tips we'd love to hear them. This morning we left Grange Farm Campsite (which for £15 quid had proved a very picturesque and convenient place to stay) just after 7am and headed to Harwich Port to catch our 9am Stena Line Ferry for a voyage that took seven and a half hours and that tipped us out at the Hook of Holland opposite Rotterdam. We arrived at the Port side and had checked through the departure process by 7.30 and we thought we'd be in for a long wait before boarding so we were quite surprised when we found ourselves on board and in our very comfortable cabin by 8.15. Then unfortunately our departure was delayed by an hour because of cargo loading - it turned out that we were waiting for a couple of lorry loads of race horses! However, it didn't turn out to be a problem because the ship made very good time on the mill pond like sea and we were only about 10 minuets late by the time we got to our destination. Also having a cabin made our crossing much more comfortable. We were able to indulge in a bit of telly watching (Flog It 😂😂), a little snooze, a couple of episodes of Eastenders (only me), a bit of reading and a picnic lunch which was accompanied by some of the complimentary goodies that had been provided for us. However, even though these included a couple of cans of Heineken and 2 small bottles of red and white wine we were obliged not to indulge at that time because John had to drive - but later, although we saved the beer, the wine went down very nicely with our evening meal🍷🍷!! Once we'd disembarked we were soon bombing along with John very comfortably converting once again to driving on right. We only had about 45 kilometres to go to get to our destination - the Het Groene Hart Camper Plaatz in the Haarlemmermeer Polder, and once there we were soon settled in and feasting on previously prepared spag bol for tea! Thursday 10th May 2018 🌧️ overnight ⛅ morning 🌞 lovely afternoon ⛅ cloud early evening 🌞lovely finish! Today we decided to bite the bullet and get our bikes out to do a bit of exploring - I say bite the bullet because we haven't indulged in any cycling activity for quite a while because John has been suffering quite badly with a trapped nerve in his neck which has resulted in excruciating pain in his right arm - and cycling seems to make it worse. While we were on home territory we attempted to get it sorted by visiting an Osteopath several times, and at first that seemed to help a great deal. Additionally, from my point of view, it really was quite entertaining seeing the expression on John's face when the Osteopath 'cracked' his neck or stuck the acupuncture needles in😨! However, now the benefits seem to be wearing off, and although he's not quite back to square one he's not much above square 3 or 4! Therefore, today's ride was planned to be very gentle and not too long, so with that in mind we copied a route we had ridden before when we visited this area back in 2016. We left the campsite and peddled the mile or so up to the Ringvaart Van de Haarlemmermeerpolder (canal) and then proceeded along beside the waterway until we reached Westeinderplassen (lake) and along the way we had the pleasure of watching numerous boats both cruising and 'parked', seeing quite a few family groups of water birds and also being buzzed by very nippy cyclists as they zoomed along the road - either individually or in large groups. There were also windmills to spot, and lots of grazing animals - but alas, no tulips this time! As we hadn't planned to be out for too long on this ride, we'd left our departure until around midday because that was when the weather prediction was for sunny skies (and for once they were more or less right)! So our timing was just about perfect for a late lunch while we watched quite a few wind surfers messing about on the huge lake that is part of a complex of navigable lakes that cover about 10 square kilometres in this area. After our windswept but sunny lunch was complete we continued our circumnavigation of the lake by riding through the very pretty and well kept town of Aalsmeer. Apparently this small town is famed for it's flower traders and boat builders, and the flowers flowing from the many beautiful gardens would certainly support the former, and furthermore, Wiki informed me that the town hosts the largest flower auctions in the world and has numerous nurseries surrounding it. Once our lake tour was complete we were soon back on the canal cycle way that would take us home, but by now the day was so lovely that we felt compelled to sit beside the water to watch the world go by - and while we were watching we also tittered at a robotic lawn mower on the other side of the water! 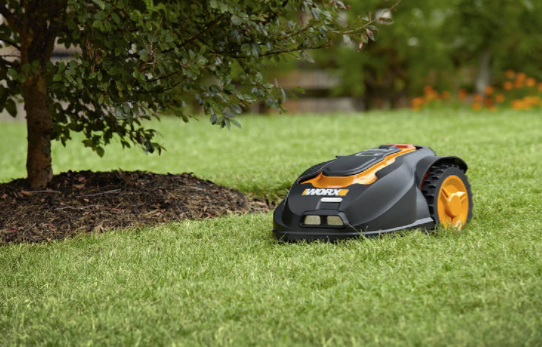 It seemed dead set on mowing the same bit of grass over and over again - if the owners don't sort it out they're going to have a bald patch soon! Then soon after that we were home and toasting our Anniversary with the cool beers that we'd obtained the day before! And later we toasted again with a very nice bottle of Spanish Red (yes we've still got some left) that accompanied our steak supper! Oh and did John manage OK? Well in the end we did just over 20 miles - he never moaned but at times I'm sure he paid for it!! Friday 11th May 2018 🌞🌞🌞 all day! This morning we left the Camper Plaatz and headed for the northern part of the Netherlands - specifically towards the seaside town of Lauwersoog where John had spied a couple more camping places that looked very inviting. On the way we knew we would probably have to refuel but when we saw the eye watering price of fuel on the motorway we decided that T4rdis2 would have to make do with fumes until we could find a cheaper alternative- Petrol was 1.76 euros (£1.54) and diesel 1.46 (£1.28)! And in the end it paid to wait because eventually we got it for 1.26 (£1.10)! Our route took us past Schiphol Airport with it's gaudily painted blue and orange planes, around the Amsterdam ring road - thus allowing us to miss the 'tight squeezes' of the city, and then eventually onto the Afsluitdijk. 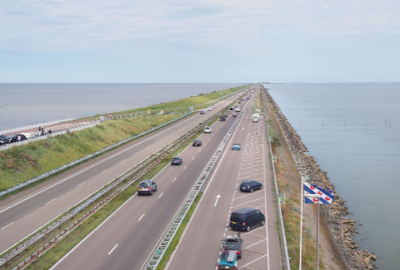 The Afsluitdijk is a causeway that was constructed between 1927 and 1932 and it's 20 mile length connects Den Oever in Northern Holland to the village of Zurich in Friesland. As you can see from the pic the main part of it is a duel carriageway but there is also a 2 lane cycle way and lots of parking - so of course we had to take advantage of that and stop for coffee (that could have been us in the distance in the upper right quarter). Thus refreshed we continued our journey on towards Lauwersoog with a quick Lidl stop on the way, and soon after that we entered the first of the 2 camping places that John had identified - 😞😞 but sadly there was no room at the Inn. However, all was not lost, we had a back up plan that came up trumps 😀😀, and that was at the Noordergat Marina a little further down the road. We soon got comfy in the very small but wonderfully situated motorhome parking area which is right on the waters edge, and as it was nearly 2.30 by then the fish finger sarnies that I quickly prepared went down a treat! After that it was walkies time and initially this required us to pass through some pretty board walked meadows. Then our big question was should we go left or should we go right out along the dyke that separates the land from the Wadden Sea! In the end we choose right and that route took us into the fishing harbour, where along with lots of fishing boats, we found several Fish and Chip shops - shame we'd just been fed!! I told him 'That's the wrong T4rdis! Not 2 big ones but 3!! After we'd finished clowning about our walk brought us back towards home and we went and saw the harbour master to pay our parking dues, and after that we settled in for our evening meal. But then as dusk set in I mentioned to John that I thought it was raining - it turned out to be millions and zillions of insects tap dancing on almost every square inch of T4rdis2's exterior! It was a good job all our windows and doors were netted because if even a quarter of them had invited themselves in I'm not sure there would have been any room left for us - I can honestly say I have never seen insects so densely accumulated - not even in Scotland! Saturday 12th May 2018 🌞🌞🌞 all day. We had another big decision today - 😂😂 - should we walk or should we cycle!! The later won so with picnic packed we set of for another gentle ride around a forested area called Ballastplaabos and then out onto the dyke that separates the Lauwersmeer Lake and National Park from the Wadden Sea! We left our parking area in the marina and with the aid of the Maps.me app we soon found our way onto the lovely cycle track that runs for about 9 miles through the National Park area. Along our way we were treated to lovely spring vistas of budding and blossoming trees, lots of water ways and lakes and also several bird calls which included cookoos and woodpeckers. However, additionally there was another call that we frequently heard but initially couldn't identify, and it was only when we paused for a short break that we realised it was probably frogs having a chat - we spotted at least 4 and it sounded like there were dozens more! And then we hadn't gone much further when we spied a sight that we hadn't expected - military tanks on manoeuvre - apparently The Royal Netherlands Army has a military base here called Marnewaard. Eventually the trail we were following came to an end but here in the Netherlands nearly all cycle trails link up with another that will take you somewhere else! 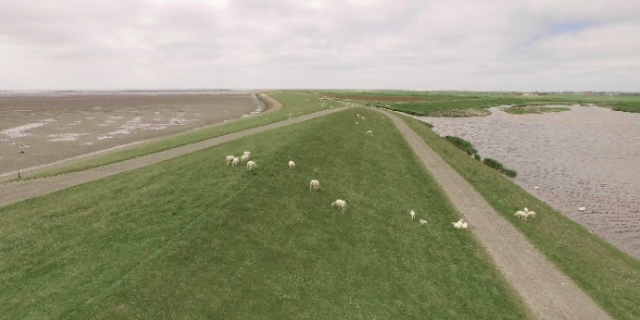 And this one was no different - it chucked us out nicely so that we were well positioned to access the Wadden Sea side of the dyke wall so then we had the pleasure of cycling along there for several more miles. The Wadden Sea is a UNESCO World Heritage site that lies between the coast of northwestern continental Europe and the range of the Frisian Islands. It's waters are quite shallow but still tidal so for much of the time vast areas of muddy sand are exposed thus providing a massive dining area for lots of different wading and sea birds. Therefore, there was plenty of activity to catch our attention as we peddled and also the high bank of the dyke provided us with a lovely picnic spot from where we could see both the mud flats and also, if we turned in the opposite direction we had far reaching views over the vast Lauwersmeer Lake. Interestingly, we later learnt that the Wadden Sea stretches from the northwest of the Netherlands, past the great river estuaries of Germany and on to it's northern boundary in Denmark giving it a total coastline of 310 miles, so with the route of our journey in mind we're quite likely to be seeing more of it in the near future. Following our picnic feast, even though it was still quite early, we decided to wend our way home because at the mo we're parked up in a lovely spot and as we'll be moving on tomorrow we needed to save some time to enjoy it a bit more. Tomorrow will see us leaving the Netherlands and continuing our journey into Germany, and our rough plan is to spend a few days there before we venture into new territories for us - it will be then that our Scandinavian adventure starts properly!